Swiss Watch Manufacturer Alpina Genève is proud to announce branding of a Swan 80 participating in various yacht regattas in the Mediterranean in 2012. The Alpina Swan has recently raced in the Palmavella and will race in the Loro Piani and Giraglia regattas in June. Later this year, the Alpina Swan will race in the Voiles des St. Tropez and the Middle Sea Race regattas. Various regatta sponsorships are activities to support the Alpina Sailing Collection. 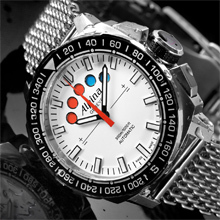 Its star product is an automatic chronograph with regatta start function. Alpina developed this regatta caliber AL-880 in-house, based on the Sellita SW500 chronograph movement. The caliber is encapsulated in a stainless steel 30 ATM water-resistant case with rotating bezel. Currently, Alpina is the only watchmaker offering such an easy to read automatic regatta caliber. 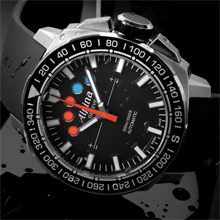 In addition to the regatta version, Alpina offers another attractively priced version the Alpina Sailing Automatic with 3 hands and a date window, with similar case and dial design. All Alpina Sailing timepieces are available on rubber strap, metal bracelet or metal mesh bracelet, for absolute comfort and security in the most extreme situations. More regatta sailing with Alpina: Besides the Alpina Swan 80, Alpina was the official watch sponsor of Extreme Sailing Series Team Niceforyou, skippered by Alberto Barovier. Barovier was the winner of the 2010 America’s Cup on board the trimaran BMW Oracle Racing. Each Alpina Sailing timepiece is offered in limited edition and is delivered in a special packaging alongside a miniature reproduction of an Extreme 40 Catamaran. Hours, minutes, seconds, yacht timer function.